William Edwards, President of Orange County Chamber of Commerce State Bank of Apopka. They started developing the 5,000 acre Pirie Ranch known as "Overtop" into a winter resort. The complex was planned to recapture the sights of the Scottish countryside and to recreate the atmosphere of the Royal and Ancient Golf Club of Saint Andrews, in Scotland and perhaps fulfill the boyhood dreams of Scottish born W. Edwards, John and Alan Pirie. The best workmen, landscape gardeners, electricians, artists, stone masons, steam fitters and other highly skilled men in their fields came from all over the world to contribute their special talents and energy. The contract to build the hotel was left to Mr. Trimble in July 1926. Beams and columns were hewn from trees cut on the property, sand for cement was dredged from a pit nearby and construction was pushed rapidly along to meet the deadline of an October 1, 1926 dedication. Boulevards and Avenues were carved, paved and named after famous places in Scotland. Oak trees by the hundreds were planted to line the streets which, today, provide shaded archways. Harry Thomas, a 13 year employee of the Laughlin & Pirie Estates and Frank Stocks, the Scottish Gardner of the Laughlin Estate near Zellwood, supervised the planting of the trees, shrubs and sod obtained from the Pirie Nursery in Lake Jem and Detwylers Nursery in Orlando. Artist-Architect, Sam Stoltz designed and supervised the building of the private homes, sunken gardens and parks. He designed the Plymouthonian type of home. According to the artist, "Nature confines her lines entirely to curves and Mount Plymouth, with its beautiful hills and valleys, is full of curves." He created the Plymouthonian homes by eliminating the usual harsh lines and produced homes, waterfalls, fountains, sunken gardens and parks in keeping with the surroundings, just as if they grew there - a part of the landscape. Tons of coquina rock were transported from Anastasia Island to fashion the waterfalls, fountains, fireplaces and chimneys. Palms and bamboo were planted to enhance the gardens. Multi-colored blossoms of the azalea, camellia, gardenia and jasmine added a rainbow of color to complete the tropical paradise. In 1926, the Mount Plymouth Hotel/Country Club was built on Dubsdread Drive. The Hotel had 150 rooms. There was a swimming pool with many other outdoor and indoor activities. There was an airstrip for guest to taxi their airplanes to the Hotel and a hanger behind the hotel for guest to repair their planes. A 300' to 500' deep well supplied water for the hotel and the surrounding community with two water towers behind the hotel. 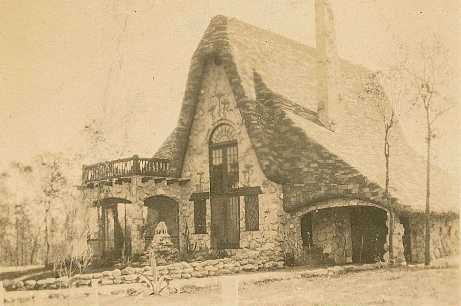 The elevated basement that served as a fountain room was used as a locker room, pro shop, dance floor, wet bar and drug store complete with a soda fountain and sundries. The Dining Room was once the largest in the south. $60,000 dollars’ worth of furniture was purchased to enhance the country style atmosphere along with the 2 Persian rugs in the lobby valued at $1000 each. The hotel was ready and opened for business Dec. 15, 1926 to Easter. This schedule was maintained until the hotel was sold. The hotel had a staff consisting of 12 maids, 4 housemen, 8 kitchen helpers, 10 waiters, 6 bus boys, 6 office staff, 3 gardeners, a 6 piece band plus a Maitre’d, 56 people in all. Fresh flowers that donned the dining room tables were grown in Sorrento. Turkeys, Chickens and all fresh vegetables were also locally from the Sorrento Area. 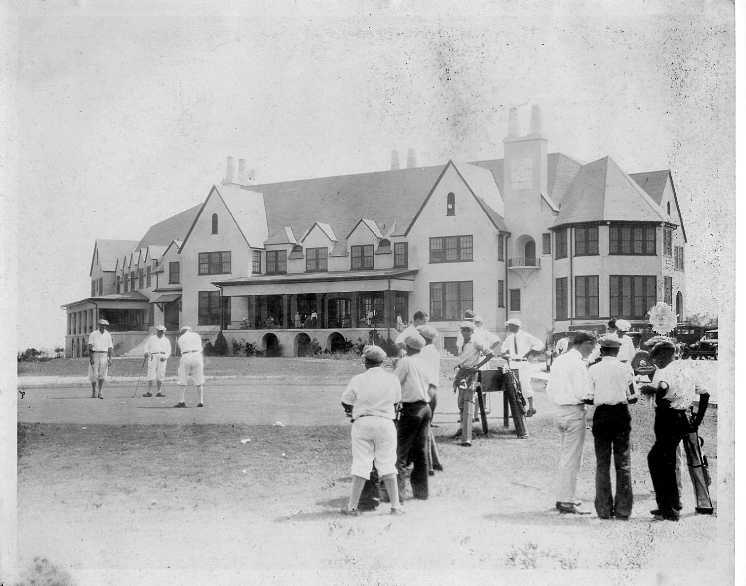 Many notable people stayed and played golf at the Hotel through the years. Connie Mack, Joe Tinker, Walter Hagen of Baseball fame played often during the 20’s. Carl Dann played daily. During this time notable people of the business, professional, and sports world flocked and availed themselves to the balmy breezes and the varied sports. Guests could listen to the 6 piece band that played in the band shell by Neighborhood Lake or go on a moonlit picnic at the Sunken Gardens or they could just swim in the pool. This is how Connie Mack spent his winters accompanied with a train load of friends from Philadelphia. Famous singers Kate Smith and Lawrence Tibbits were guests. Movie actress Nancy Walters who played in the Elvis movie “Blue Hawaii” was born in the Hotel. Al Capone, was rumored to have vacationed at the Hotel and stayed in Room #264. After the stock market crash in 1930 there were few guests and the Post Office in the Hotel was closed. During this time the Maxey’s purchased the resort and during World War II they dug up the copper pipe to aid the war effort. In 1958 Mickey Mantle hosted a Golf tournament called the Mickey Mantle Sports Festival at the hotel to aid the Daymon Runyon Fund to aid in Hodgkin’s disease. Whitey Ford, Birdie Tibbetts, Cary Middlecoff, Chi Chi Rodriguez, Kathy Whitworth and Louise Suggs all participated. In September 1959 the hotel was closed and was leased to Gen. T.L. Alexander and Col L. E. Allen who founded Florida Central Academy, strictly a school for boys. The school was very successful and became co-ed in 1971. Students attended here from 34 states and 24 countries. In 1979 Mr. Walter Tierney purchased the school and proceeded to restore the School to its former elegance and expand the facilities by building a gym and many other upgrades. By 1981 the school was in financial trouble and lost its accreditation and by 1983 it was closed due to bankruptcy. Shortly after that the building was condemned. The Hotel/School sat abandoned and was vandalized by kids for the next 2 ½ years. 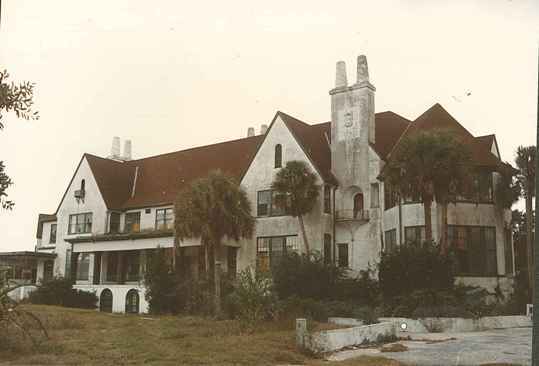 It was rumored it was haunted and kids came from all around to view this abandoned site. On January 6, 1986 this Historical site was destroyed by fire. Old Entrance Way "The Wall"
In the summer of 2011 the Preservation Committee of the East Lake Historical Society led by Maggie Fisher, Dot Pegues and Nancy Williams decided to do something to recognize the site of the Mount Plymouth Hotel/Country Club and Florida Central Academy. The only remaining structure that existed was the walk way surrounded by a wall on each side, commonly known as "The Wall”. The committee included Board Members, Florida Central Academy Alumni and residents of the Fairways Subdivision and other people from the community. After several months of clean up, on October 29, 2011 over 75 people attended the dedication. Guest speaker Bud Brookes, former Head Master and Judy Fenby of the FCA Alumni spoke. The Alumni presented all the volunteers with a plaque of appreciation and donated money to help erect a monument in honor of the Hotel and Academy.